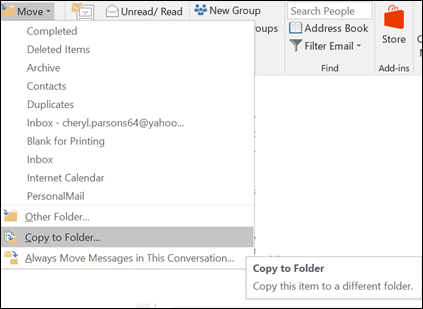 Just as a file cabinet contains folders to help you organize your documents, Outlook gives you a similar way to save and organize email messages. You can move or copy messages between folders in several different ways. To select adjacent messages, click the first message, and then hold down Shift and click the last message. All messages in the list between the first and last message you clicked are selected. To select nonadjacent messages, click the first message, and then hold down Ctrl and click additional items. Select the item you want to move. Drag to the destination folder, and then release the mouse button. Note: If the folder you want to move or copy the message to does not appear because it is in a collapsed folder, hover the mouse pointer over the collapsed folder icon and the subfolders will appear. Repeat this as necessary until the folder you want appears. Select the item you want to move by holding down the right-mouse button (or the alternate mouse button if you're using the mouse with your left hand). Drag to the destination folder and release the mouse button. When the context menu appears, select Copy. On the Outlook ribbon, select Move. To move an item to a folder, select the folder from the drop-down list. If your folder isn't listed, select Other Folder and select the folder from the Choose Folder dialog box. To copy an item to a folder, select Copy to Folder. Select the item you want to move or copy. To move, right-click and select Cut. To copy, right-click and select Copy. Alternatively, you can use the keyboard shortcut. To copy the item: click Ctrl+C. Navigate to the folder where you want to move or copy the item to, and then click Ctrl+V. Note: If the folder you want to move the message to does not appear because it is in a collapsed folder, hover the mouse pointer over the collapsed folder icon and the subfolders will appear. Repeat this as necessary until the folder you want appears. Select the item you want to copy. On the Edit menu, click Copy to Folder. In the Copy Items box, click the folder where you want a copy of the message saved, and then click OK. Note: If you want to create a new folder, in the Copy Items dialog box click New. In the Move Items box, click the destination folder, then click OK.